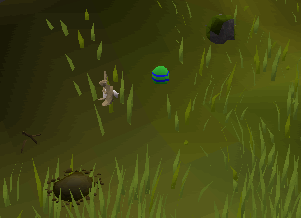 This Easter, the Easter Bunny is running a bit behind with delivering Easter Eggs to the little boys and girls throughout RuneScape. So, she decided to make the regular Bunnies help... which isn't working very well, as they don't understand the tradition of hiding eggs for the children to find. Can you help the Easter Bunny out? Note: This event was only available from 10 April 2006 until 24 April 2006. 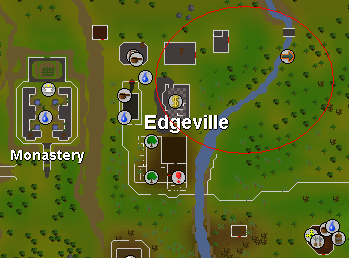 Collect some eggs from the Bunnies northeast of Edgeville or south of Falador. The first thing you'll want to do is find the Bunnies and collect some eggs. 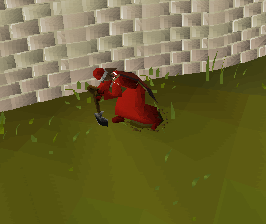 You'll be able to find lots of them near Edgeville, as well as south of Falador. 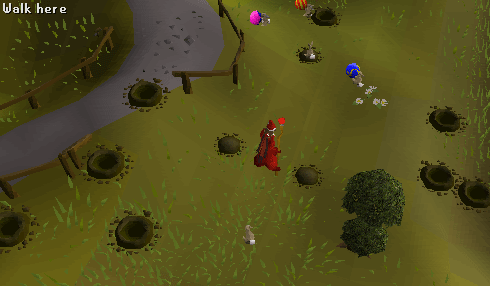 Hunting for eggs is recommended in Falador, because sometimes the bunnies can "lure" you into the Wilderness! Before you head off to find those eggs, don't forget a Spade! 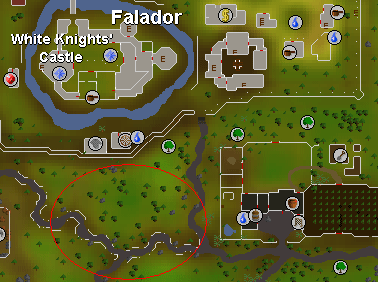 You can find one respawning in the house just south of Falador Park, in Draynor manor, upstairs in Varrock general store, in the middle of Rimmington mine or bought in farming shops. You'll probably want to have an empty inventory, and make sure you aren't wearing anything heavy, since those Bunnies tend to hop around a lot! When you arrive, you'll find lots of holes and mounds. There will also be tons of rabbits hopping around. Some will bear Easter eggs and those without have just buried them in the mounds. Now we come to the egg-getting part: Go walk on a mound and dig your spade. You should have now found an Easter Egg! It will appear in your inventory. The eggs heal 10 Life Points and their taste appear in the chat box when you've eaten one. It will say: "mmmm... [taste]." Now, dig up 11 eggs (of course you can dig up more, but this is the fastest way). Be sure to have at least one Magic Egg among them. Go talk to one of the children (they're located a bit east, near air altar). They will ask for an Easter egg. If you pick the first, you'll give the child an Easter egg, that means one will disappear form your inventory. The child may say: "Yay! Thank you [name]!" or possibly "[name] is the Easter bunny!" Continue handing out eggs to the children until you have given 10 eggs. Be sure that the last egg left is a magic egg. Every time you give an egg, a message will appear in your chat box telling how many you have given so far. Note: You can also give the children eggs by using the eggs with them and your character will say "here you go, have an egg." Ok, this is what you do next: Walk on a hole and eat your Magical Egg. A message in your chat box will say that you can use the "Rabbit Hop emote." When using it, you hop like a bunny! You'll be able to keep it after the Easter update ends. As you can see, it's called funny bunnies. You'll only be able to access your music player, your friends and ignore list and the log out button. 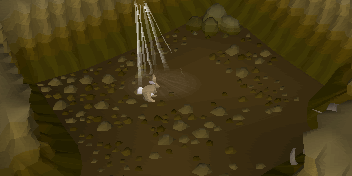 If you log out while being in the rabbit's warren, you'll automatically find yourself "overground" when you log on again (and if you held an egg it will be in your inventory). Also, your weapon will be unequipped. The next thing to do is walk to the "middle", where there will be piles of Easter eggs, bunnies and speakers. You can take an egg from the piles and choose which flavor you want (You can only have one egg at a time, and when you first have one you can't change it). If you try talk to one of the rabbits, it will seem hypnotized. You'll find the reason by listening to the speakers; they're hypnotizing the bunnies by telling them to take and hide the eggs again and again - bunny language of course. 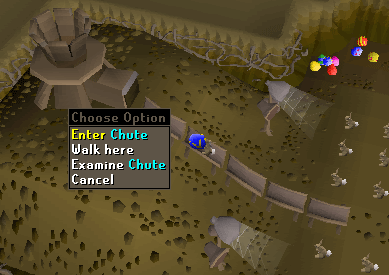 There is also a chute that you can climb. If climbing, you'll meet the Easter bunny! If you climbed the chute, you'll be in a small room. 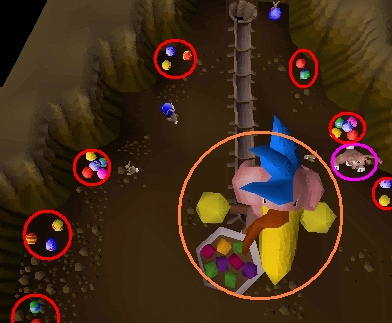 The red circles show the Easter egg piles. The pink circle indicates the Easter bunny. Inside the orange circle, the Easter bird is. To get your reward, talk to the Easter bunny. Choosing the "okay" option will end the conversation. Selecting "what's happening here?" will make the Easter bunny explain why the rabbits are acting so odd. And then you explain that they just bury them in the ground instead of giving them to the children. It's here the Easter bunny asks for your help. You'll have to hand out eggs to the children. But since you already have, you don't need to. Now (if you have given 10 eggs) the Easter bunny will reward you with an Easter ring! Since you can't access your inventory, you'll have to get above ground again to try it. To get up again, you need to go to one of the so-called "lights". You can find them on the map by finding the green dots. They're really not lights, but holes to get up. You'll now find yourself "overground" (if you had an egg while being rabbit, it will now appear in your inventory). You're now standing at grass or whatever-you-stood-on-before again and if you click your inventory you'll find the Easter Ring. Here comes the magical part of it: If you wear it, you'll turn into an Easter egg! Though if trying it while still being at the "rabbit-place" you will quickly turn back human (and your ring will appear in your inventory), because the "place is too filled with Easter magic." Try walking a bit away from that place and wear the ring again. You'll now be an egg (as shown in the photo, just a plain Easter egg in the middle of the landscape)! You can't move, because you'll turn human again, but it is possible to "egg-slide". You can do this by wearing the ring while you're walking. The egg (you) will slide a bit. You can also egg-slide by get a book from the wise old man's house and click it multiple times by while walking. When you wear the easter ring, you'll transform into an egg and egg-slide to your walking target! When you become an egg, it's random which color you become. You change color every time. Also, if you right-click a player-egg, you'll see the name and the combat level of the player. You can't access your inventory, your stats etc. There will only be one thing you can do, while you're being Easter egg; write in the chat box. So you can talk to passers-by. The only menu you'll see is the "Unmorph" menu. Of course, if you click "unmorph" you'll become human again. The eggs will melt, rabbits, holes and mounds disappear and so will the whole rabbit warren, when the Easter update ends; 24th April 2006.